Princess Bea isn’t like other princesses—she prefers pirate ships above tea parties, the salty sea over silly dolls. But what’s a landlocked princess to do? Ahoy, Captain Jack to the rescue! When the captain offers Bea a place aboard his ship, it’s a dream come true—until she’s put to work swabbing the decks and making dinner for the crew. Can a princess like Bea put her royal gifts to work and make the pirates see that she’s seaworthy after all—or will they make her walk the plank? Pirate Princess is a raucous tale of girl power on the high seas, from author Sudipta Bardhan-Quallen and illustrator Jill McElmurry. 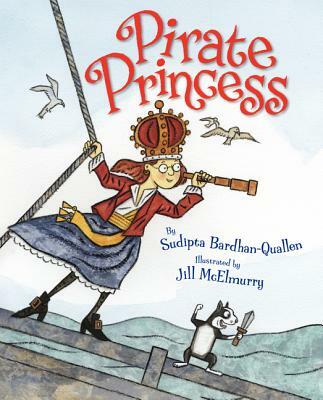 Sudipta Bardhan-Quallen is the author of numerous fiction and nonfiction books for children, including Pirate Princess, illustrated by Jill McElmurry; Hampire!, illustrated by Howard Fine; and Tightrope Poppy the High-Wire Pig, illustrated by Sarah Dillard. Sudipta lives in New Jersey with her family. Jill McElmurry is an author and illustrator of more than a dozen books for children, including Mad About Plaid and I'm Not a Baby She studied art at SUNY Purchase and the School of Visual Arts in New York. When she’s not producing books, Jill enjoys working with her husband and dog on their Higglety Pigglety Farm in New Mexico.